1. 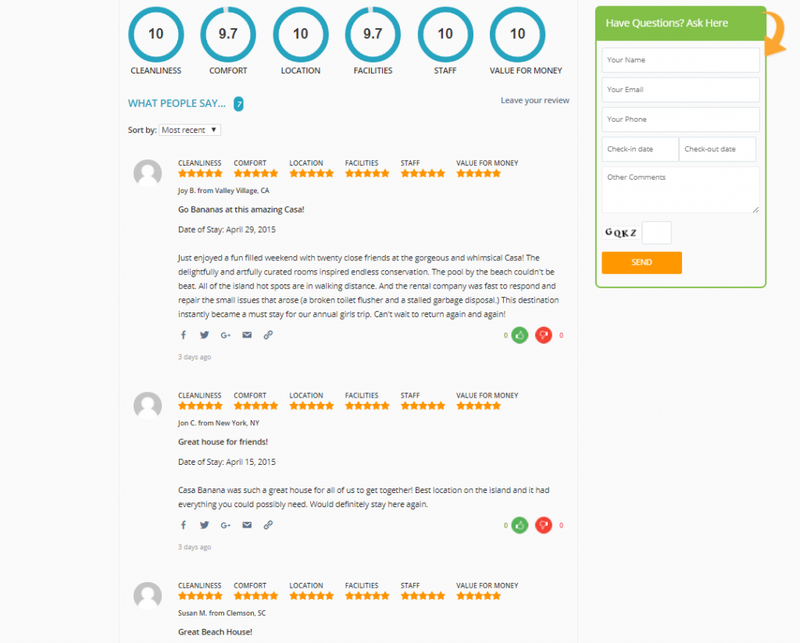 Add reviews – Reviews help sales, conversion and your SEO. With every review you add to your listing, you increase the chances of that listing being found online. Have you added reviews to your listing yet? Do it right away! 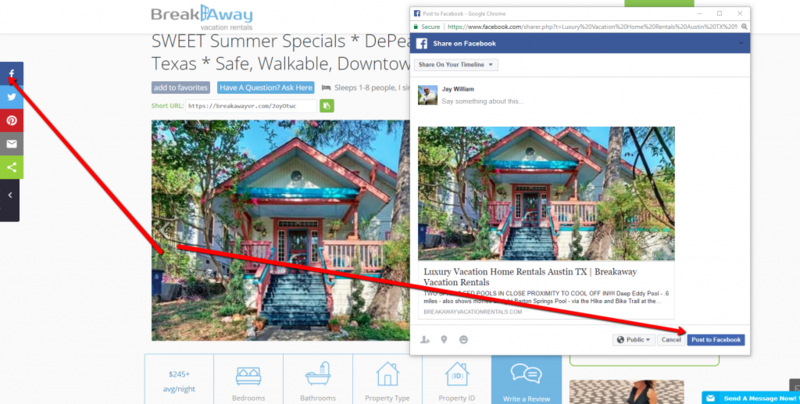 Keep in mind that with vacation rental websites like HomeAway there are often jarring changes made without notice. Last week we saw reviews disappear from certain listings. We’ve also observed how some reviews weren’t published on their site after being submitted by travelers. Could reviews have branding information they don’t want on their site. Not sure, but it’s best to protect your reviews, so collect them now, then add them to your BreakAwayVR listing. Your reviews are safe with us! Strengthen your listing by consolidating your reviews from all 3rd party sites and adding them in one place. Doing this will give your BreakAwayVR listing an SEO punch. Below is an example of how reviews also made Tina Smith’s BreakAwayVR listing look fuller and more credible. Tina manages what are arguably the most unique vacation rentals in Isle of Palms S.C.. She’s earned many great reviews and is showing them all off in one place. Members Note: To add reviews to your listings – click on the blue “write a review” tab under your property slideshow. Add as many reviews as you’d like by refreshing the page after each review submission. 2. Add a photo of yourself (a good one). If you want more travelers to send you an inquiry, you need to get them to connect with you, lower their resistance and get them to trust you. The easiest way to get people to connect with you is to put a pleasant face alongside your property. Deborah Porter is the owner of a vacation rental near French Lick Indiana and she’s got a better than average profile photo. When I look at her photo I feel like they’re friendly and loving hosts. Lots of warm and fuzzies. Awesome effort Deborah! 3. Add information about yourself and your business – We’re creating multiple ways to advertise your listing and your vacation rental business. 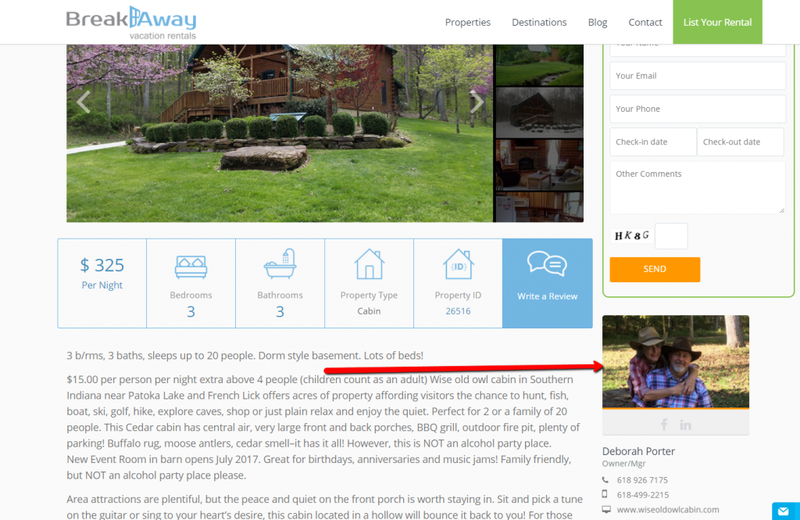 When you list a vacation rental on BreakAwayVR.com you get your listing page, but you also get an additional business page to help you extend the reach of your vacation rental listings. This area is much like the “about us” section of a website. We give you this space to help you connect with travelers but to also help you obtain higher visibility for your vacation rental business in Google. Use it to your advantage! When a potential guest clicks on your profile photo they’ll be brought to your owner/business page. Below is an example how Shelly Rice is leveraging it. 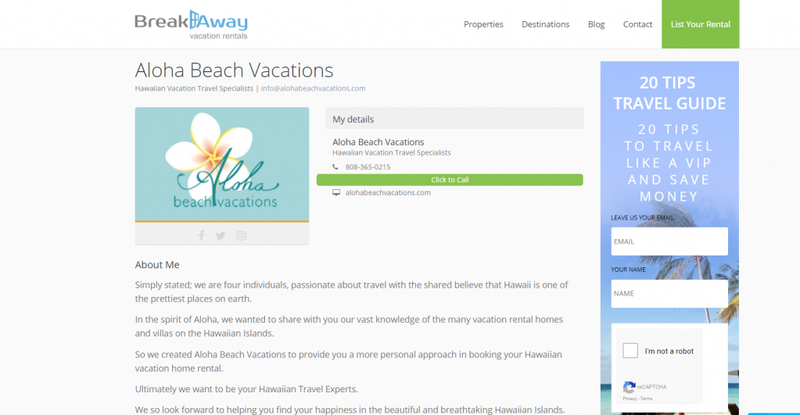 She has listed over a dozen Hawaii Vacation Rentals under her vacation rental property agency Aloha Beach Vacations. In this case, Shelly has decided to make it a business page for her Hawaii agency and use her logo instead of her photo. It’s professional and helps with your branding for sure. Great Job Shelly! 4. Share your listing on social media. In the world of online marketing there’s something called “social signals.” Social signals are important because Google uses these signals to determine your listings relevance and importance. These signals are often communicated as “likes,” shares and other engagement factors that are used like a popularity gauge. Google uses these social signals to determine if other people will care about what you’re offering. The more your listing is shared, the more Google will share it. This, in conjunction with our marketing efforts will make an impact for your listing. To share your listing, simply go to your listing page and click on the social media icons in the top left area of your listing page. This feature allows you to quickly share your listings to dozens of social media channels including Facebook, Twitter, Pinterest and more. Have a look below of how I’m sharing Deborah Peacock’s photo of her vacation rental in Austin Texas. 5. Add your listing link on your website. Placing a link to your listing on your website will help your listing get found. 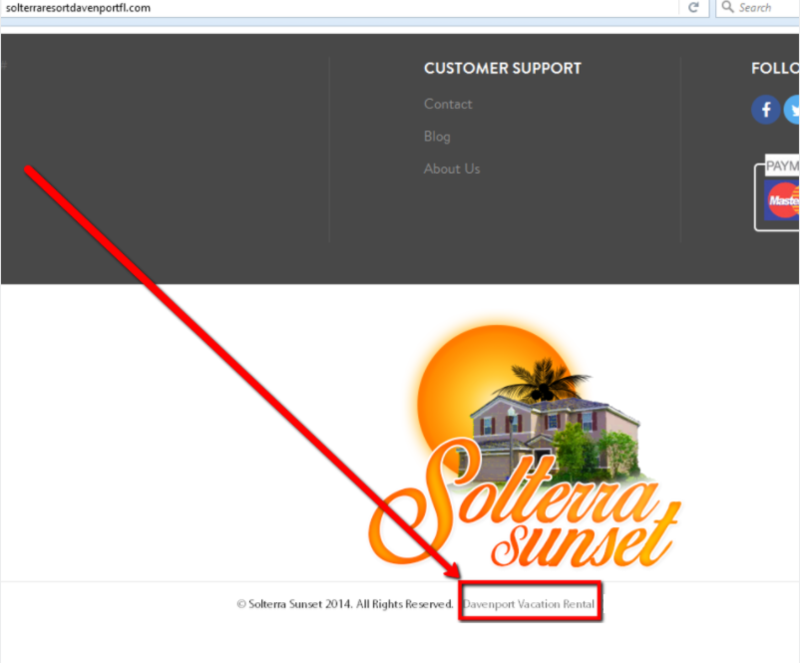 You can add a link to your website footer. It’s a small thing that can be a big help for your listing’s online visibility. This will strengthen your listing. If you are wanting to help us and most importantly your listing, this is a big way you can do that. Here is what that would look like. Below is an example of how it was done for Oliver Ballhatchet an owner of a vacation rental in Davenport Florida. BTW, you should only do this for sites that you are supporting. If you are linked to sites like VRBO and HomeAway – you may want to consider unlinking from them. 6. Create depth in your description. Is your vacation rental description on the skimpy side? If so, it’s hurting your listing. Remember that having rich content is key to your search engine visibility. Google does not like “thin content” a skimpy description can cost you your visibility online. These aren’t my rules – they’re Goolge’s. When writing your description be sure to cover all of the bases. Provide ample information about your property, features, amenities and area. If you want your property to show up for a variety of searches related to your rental and location, then you have to write a thorough description that includes those keywords within your listing. Two members who’ve done a great job with providing an in depth vacation rental description are Kevin and Mike. They rent vacation rentals in the Bahamas, Park City Utah, Daytona Beach Fl, Hawaii and other destinations. As you can see they’ve provided a thorough description. They’ve also spaced the content out so it isn’t a wall of text. This makes it skimmable for guests. Kudos to Kevin and Michael for creating a content rich description! 7. Location. Do you want to come up for certain search terms on and off our site? Help your property in our search results and in Google’s search results by including keywords that are related to your vacation rental destination and local areas. Here is an example – if your property is in Davenport Florida just outside of Orlando, you’ll want to mention something like “near the Orlando area” within your listing, so when people search Orlando or Orlando area your listing will show up. Our search feature will show results based on the contents of your listing. 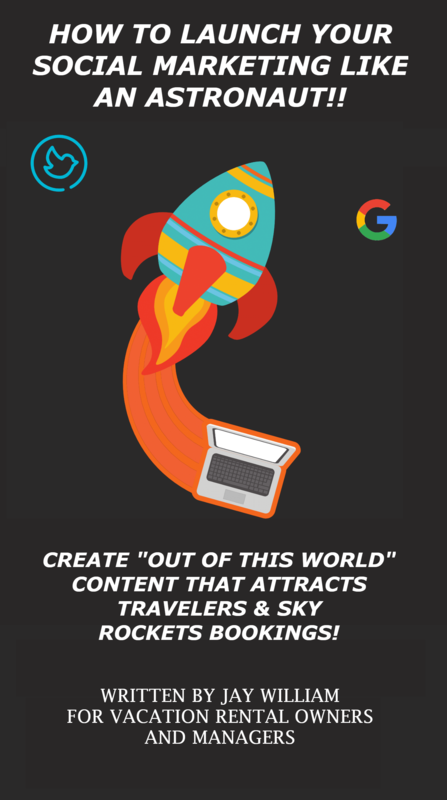 In that sense, it works more like Google by examining your content and sharing the best matches for travelers based on keywords. Your listing results will be based much on the quality of your vacation rental description. Be thorough and include all of the details in your description. We’ll do the rest! Below are some examples of how to get your property found by using location keywords. Use keywords like these to get your listing to show up in our search and Google’s. Add location?keywords to your listings ASAP! Great work to all who’ve taken the proper steps to populate your vacation rental listings. We know these tips will help us to further extend the reach of your vacation rental marketing and booking results. 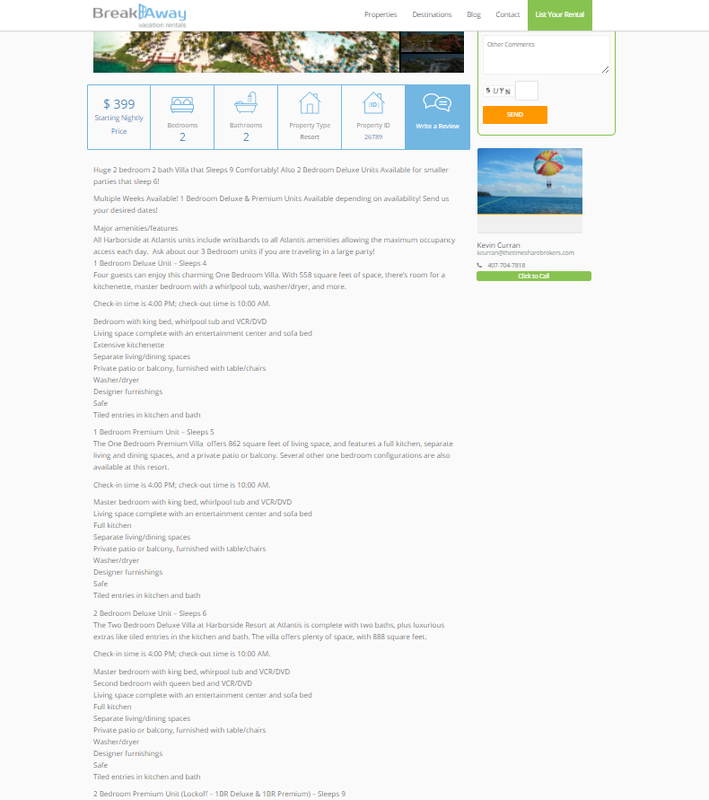 Not listed on BreakAwayVacationRenals? Get in with the rest of us who are breaking away from unfair business practices, fees and taking control back of our vacation rental businesses! Click Here To Join BreakAwayVR Today!